Game 4 at the SAP Center was nerve-racking for fans. 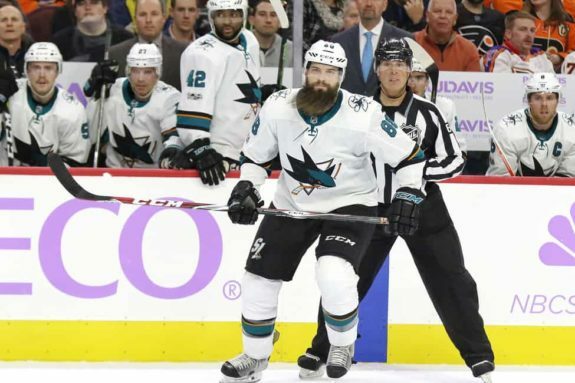 The series was at 2-1 in favor of the Vegas Golden Knights going into the game and the San Jose Sharks hadn’t dominated for an extended stretch of any game. The prospect of dropping both games at home was a scary one, and the idea of heading back to Vegas with their backs against the wall would spell certain doom. Nevertheless, the Sharks came out swinging in Game 4 and while their offense was unstoppable, the defense was the highlight of the night. All six of the Sharks’ defensemen looked calm and collected on the ice. 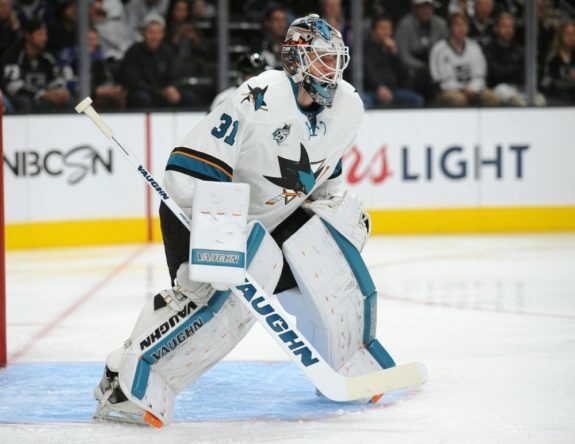 There was no major breakdown in the slot and netminder Martin Jones was able to make almost every save with ease. But what prompted this defensive showing? After three borderline terrible games, how did the Sharks’ blue line come up big? To the surprise of no one, the first major change was swapping Joakim Ryan for Paul Martin. Martin is too slow to compete in today’s NHL and it was on display all series. He had to rely on partner Brent Burns to cover for him, which is never a good thing as Burns can barely cover for himself. 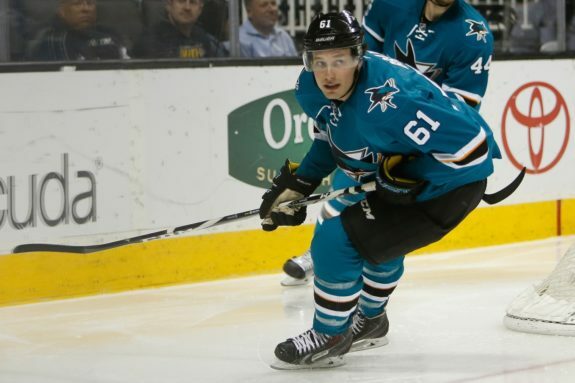 While I appreciate Martin and what he’s done for the Sharks over the past two years, his time is up and the Sharks needed new blood, particularly blood that could keep up with the Vegas attackers. That relief came in the form of Ryan, who outperformed expectations. Ryan is the perfect partner for Burns, as his hockey sense is quick enough to understand that he needs to be as safe as possible in all three zones. I think the perfect representation was when Burns travelled down low in the offensive zone, Ryan glided toward the middle and just outside the blue line in case of a turnover that led to an odd-man break. This savvy thinking allowed Burns to relax and focus on playing his style of hockey. The duo was incredible, and their stats reflect it. In just over 11 minutes together at five on five, the pair earned a Fenwick rating of 57.14% and only gave up four shots on the night. That’s insane considering Burns gave up 26 shots in the first three games of the series, an average of just over 8.5 shots per game. What’s more, only one of the four shots was from the slot resulting in only one high danger chance against the pairing. And while Burns and Ryan didn’t produce any high danger chances of their own, they only started in the offensive zone 40% of the time and won the scoring chance battle 3-2. Overall, Ryan was exactly who Burns needed to get him going again. While they didn’t produce much in the way of goals, I wouldn’t expect that to continue as they look fierce in all three zones. Justin Braun is my pick for breakout Shark of the year and I’m sure many would agree, although his partner deserves some credit. 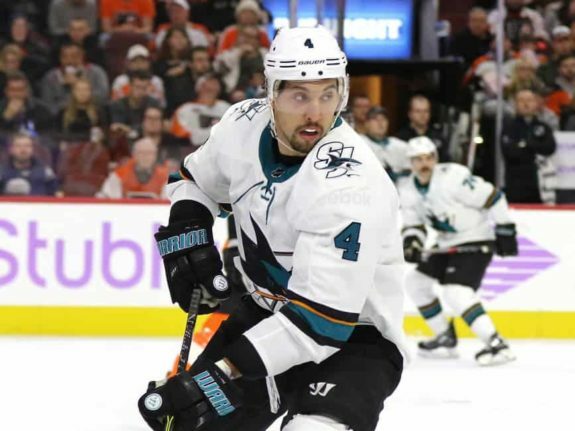 Marc-Edouard Vlasic has been the most underrated player in the NHL for years Ibut it seems that some of the media are looking to change that). The pair has been nothing short of excellent all series, and they were even better in Game 4. Braun and Vlasic took on tough minutes as usual. They matched up almost exclusively against the Knights’ top six and spent over 10 minutes at five on five against William Karlsson, Jonathan Marchessault, and Riley Smith. The Knights’ best line has dominated all season and spent the first three games putting on a similar show, but were effectively neutralized by the Sharks’ shutdown duo. Unlike Burns and Ryan, Braun and Vlasic started in the offensive zone 55% of the time yet rarely ended there. The Knights’ top line is expert at breaking the puck out of their zone. But where they were successful on the breakouts, they had little in zone entries as the shutdown pair formed a wall at the blue line. The Knights had to relinquish their possession-based entries in favor of dump and chase hockey, not something that they’re known for doing. The quick transition play of the Sharks’ defense kept the puck out of the defensive zone for long stretches of time. Things were kept even as far as possession goes, with the duo ending the night with a 50% Fenwick, but they shined in high danger chances. While Braun and Vlasic gave up two, they were on the ice for five of their own. An incredible amount that sadly did not result in any goals, but will soon enough if this effort is maintained. I haven’t always trusted Dylan DeMelo and Brenden Dillon, but the pair has been good for the past few games or so. Watching the game and then updating my stat sheet was strange, as their play didn’t reflect some of their stats in my opinion. Overall, they had a positive impact for the Sharks as the duo adopted a bend but don’t break mentality. They allowed seven shots on net all game, but only one came from the slot or lower. They protected the high danger areas with precision and rarely let any passes through. DeMelo and Dillon didn’t do a great job of controlling the pace of play, with a 38.46% Fenwick in their 12 minutes of five on five play. But to be fair, they only started in the offensive zone 42.86% of the time and played against the Knights’ middle six for the majority of it. Despite the lack of shelter, the duo was on for two goals for as well as five high danger chances. At the opposite end of the ice, the pairing only surrendered one high danger chance and zero goals. My hope is that Peter DeBoer continues to trust this line so Burns can be used to his fullest offensive potential. The fact is that anytime a third defensive line can be considered a non-liability, it’s a victory. Game 5 is on Friday as both the Sharks and Knights will look to take a commanding 3-2 series lead before returning to San Jose. If the Sharks want that edge, their defense will need to come out swinging and put up a similar performance to Game 4. While Jones had a great night in goal, he wasn’t really challenged at five on five and he owes that to his defense. They say defense wins championships, and who knows, these guys could be that defense.